I was proud of myself for getting my year-in-review letter out to friends and family on January 1. My goal in the past has been to send it sometime between Thanksgiving and Christmas, but I almost never succeed in doing that. So I have cut myself some slack and now just call it a New Year letter. But I try to touch on the highlights of the past year, along with a verbal snapshot of my family’s current state of mind and activity. Although I love to blog, this kind of letter always feels like a chore because I hate to summarize. I hate to summarize, in turn, because I have a terrible memory, and I mean terrible. My memory often does me disservice. I am so focused on the present that I often forget very important things in the past or obligations for the future. My poor memory handicaps me as a writer. So I almost always forget to say something in the yearend letter that really should have been reported. This year I realized, almost as soon as I had hit the “send” button, that I had forgotten to mention the most significant event of the year: the death of my brother. I had even mentioned the death of my cat, for pity’s sake, but not the rather sudden passing of my brother in March, the first of my four brothers to die. How could I have neglected to mention that? Partly because I was in so much of a hurry to get this letter off that I didn’t even scan my own blog posts of the past year. What is most disturbing is that this memory lapse is part of a pattern. I have always had difficulty remembering deaths. I have trouble remembering which of my aunts and uncles are dead or alive, let alone when they passed. Certain cousins. And, of course, I never know which celebrities are dead or alive, not that that matters so much. It just seems strange. Is it denial? Partly. I don’t like to think about death and dying. But it seems to point to a deeper self-centeredness, a kind of narcissism that my porous memory system plays into and that is getting more pronounced as I age. It has to do with the limits of my capacity for attention and, thus, memory. As I move forward, things get left behind. I can only hold so much in my consciousness, and the more fully I concentrate on the present, the more ruthlessly my brain prunes away the past. Events and people that are no longer in my current preoccupations drop away. Blogging feeds into this lack of historical memory and perspective. I blog about the immediate present and, once I have written about a topic or a person or a thought that is on my mind, it goes out of my mind to make room for the next thing. But today, the spirit of my brother hovers over my shoulder, chuckling, I hope, at my dopiness. This whole business can be summed up in an image. When I was clearing a shelf recently I found a very old Bible that I had not opened for years. 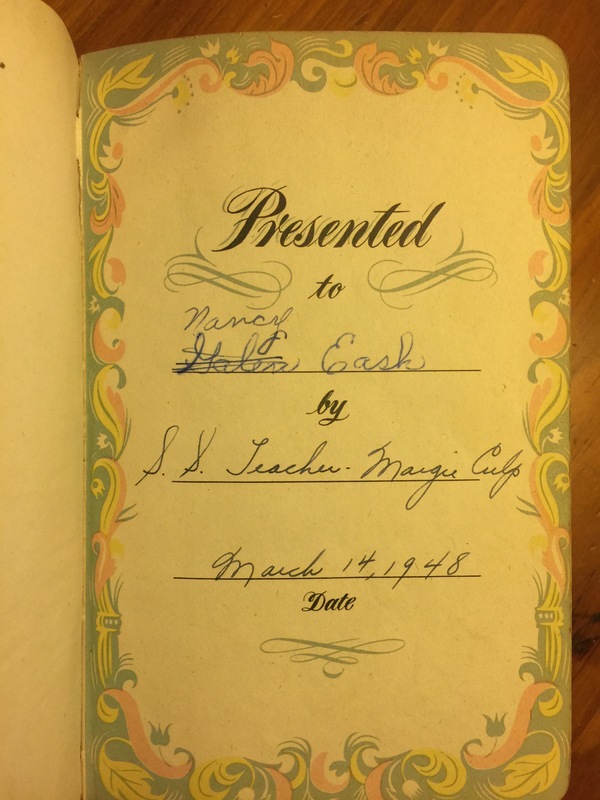 On the flyleaf was a note that this Bible had been presented to my brother by a Sunday School teacher in 1948, when I would have been 4. But when I was about 10 I had crossed out his name and written my own. Did he pass this Bible on to me or did I just find it around the house and take it for myself? I don’t remember. I thought of sending it to his family but I think I should keep it. In his memory and as a reminder.